October Beading Challenge Theme: PURPLE WITH A POP!! Guidelines: We want to see what you can create in this month’s theme! Purple with a Pop means that your color scheme will be PURPLE(S) plus a POP COLOR of your choice!! (Many beaders find picking a “pop color” to be difficult – this makes it a great challenge) I’ll be giving you some product ideas below, but feel free to use whatever you have in your own stash! Purples and Gold? Purples and Lime Green? Purples and Orange? So many lovely and funky options. Take some inspiration from my ideas below or come up with your own! This challenge is all about pushing yourself to work within a theme, but most of all – HAVING FUN and ending up with a beautiful creation to wear with PRIDE. If you’d like to share, I’d love to see what you come up with! Feel free to send a picture of your finished piece (or even unfinished pieces! This is no pressure, right?) over to me via Facebook Messenger on the Eureka Crystal Beads page! Make sure to let me know if it’s ok for me to share your picture(s) on our Facebook page – we plan on putting up a fun album with all your Purple with a Pop projects! 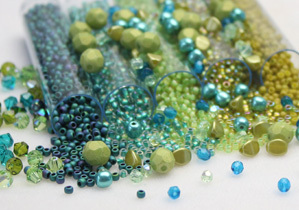 Lavender Earth Coordinated Mix TOHO Size 11 Rounds Seed Beads – Here is a lovely mix of soft purples with a pop-addition of limey/bronzy greens! This would make a great start to any project… We also carry a matching Swarovski Crystal Bicone Mix, Czech Glass Bead Mix, and Rivoli/Chaton mix! Previous Post Project: Netted Beaded Bead! Next Post OCTOBER BIRTHSTONE: THE AMAZING OPAL! Purple is very fitting since it is the color for Domestic Violence Awareness Month!